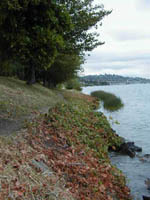 The Lake Washington Subarea has been heavily modified by human development. The majority of shoreline is now in urban residential use, except for a few commercial and industrial developments. All species of salmon in the Lake Washington/ Cedar/ Sammamish watershed migrate through and rear in Lake Washington. Predation and competition by other species as well as degradation of shoreline conditions are among the primary factors contributing to salmon habitat decline here. Salmon habitat projects in the Lake Washington Subarea funded through the WRIA 8 collaborative process are now included in the Habitat Work Schedule (HWS) state-wide website. In the website, click on the WRIA 8 watershed on the state map to enter our HWS website.